1 x 1st stage: 5 micron sediment filter that can effectively remove rust, sand, and solid impurities in the water to protect the delicate UF membrane. Lasts 6 months. 1 x 2nd stage: State-of-the-art UF hollow fiber membrane that uses standard home water pressure to push water through a Semi-Permeable membrane. Suspended particles and materials of high molecular weight, such as bacteria, are unable to pass through the 0.1 micron UF membrane, leaving you with only fresh clean water and dissolved minerals. Lasts 12 months. 1 x 3rd stage: KDF media (or kinetic degradation fluxion media) with activated carbon. KDF itself is known to kill algae and fungi, control bacteria growth, and remove chlorine, pesticides, organic matter, rust, unpleasant taste and odor, hydrogen sulfide, iron, lead, nickel, chromium, cadmium, calcium, aluminium, mercury, arsenic, and other organic compounds. When used with carbon, KDF can extend the carbon filter life up to 8 times. It also adds a healthy dose of zinc ions to the filter water. Lasts 6 months. 1 x 4th stage: Post activated carbon filter. Adopting fine coconut shell activated carbon with ultra-micron aperture, this carbon filter absorbs residual chlorine, organics, humus, and odor. Lasts 6 months. 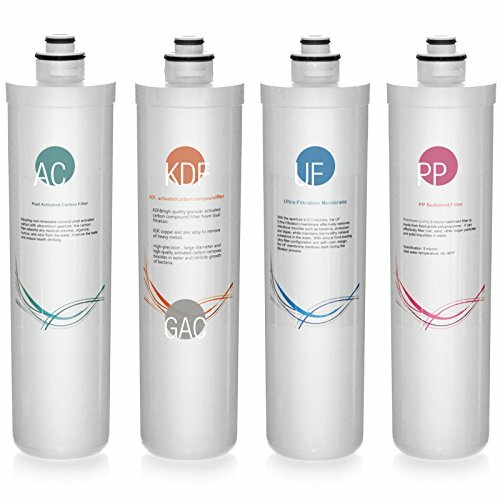 1st Stage: 5 Micron sediment filter that can effectively remove rust, sand, and solid impurities in the water to protect the delicate UF membrane. 2nd Stage: State-of-the-art UF Hollow Fiber membrane that uses standard home water pressure to push water through a semi-permeable membrane. 3rd Stage: KDF media (or Kinetic Degradation Fluxion Media) with activated carbon. 4th Stage: Post Activated Carbon Filter. Adopting fine coconut shell activated carbon with ultra-micron aperture, this carbon filter absorbs residual chlorine, organics, humus, and odor.